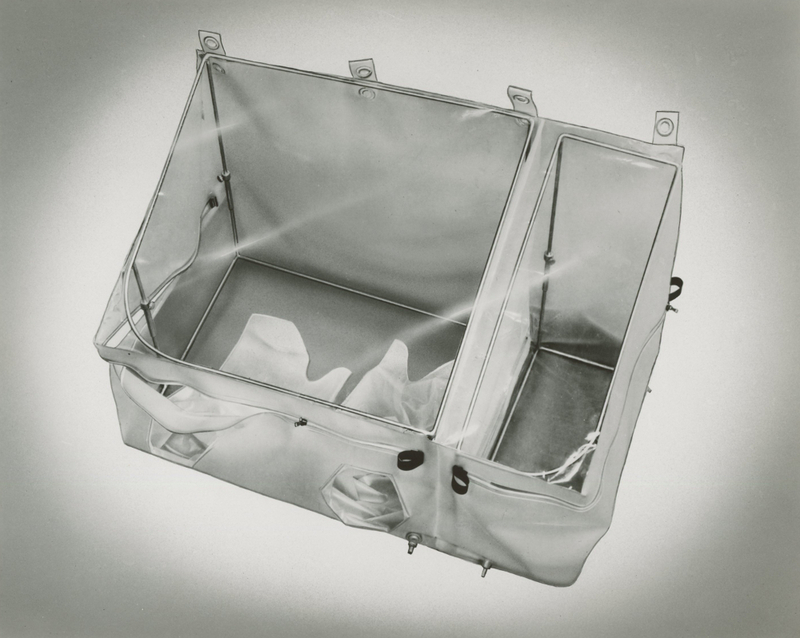 The Flexible Glove Cabinet is of particular importance where manipulations of equipment or biological or chemical material have to be made in a controlled atmosphere, or where absolute sterility is required. A collapsible frame of plated steel rod is erected inside the cabinet and this maintains it extended even under slight negative pressure. This makes the cabinet practical for use with slightly radioactive materials. The entire compartment is made from heavy plastic sheet, welded by special high frequency welding machines. The gloves are also made from plastic sheet, and are welded into position. This material is practically inert to most chemicals and in the thickness used, is highly resistant to tearing. One of the great attractions of this whole system is the use of specially moulded plastic zippers. These have double interlocking moulded ridges and when zipped up are air-tight except for a small leak at one end of the zipper.